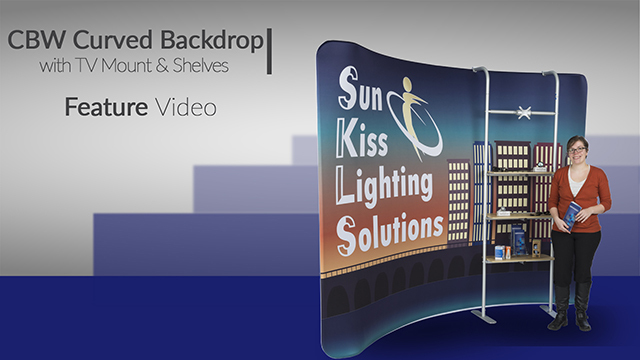 This 10' booth backwall system is great for trade shows, promotional events, or business conferences. Learn about the key features such as its portability, easy assembly, and lightweight frame. Showcase this backwall system to promote business traction and notoriety for potential clients and future customers. Becca: "This tradeshow backdrop has all the bells and whistles and none of the hassles. A tv mount and wooden shelving makes this more than just a visual display - its highly functional, too! This display may be 10 ft wide but canvas carrying bags and a lightweight frame ensure its ease in portability. Assembly is easy thanks to simple click into place aluminum pipes. Just follow the consecutively numbered tabs on each pipe for a quick and easy set up. Single sided dye sub printing brings your company’s logo and message to life with vibrant colors and crisp images. Pull the graphics over the frame and zip closed. Then, once your frame is dressed and standing,  clip the shelving unit anywhere along its length for a truly custom display. Attach the included VESA Mount bracket to hold a 20 to 30 inch monitor or TV and you’ve got yourself an inclusive, fully functional backdrop display."